That is why going to see a project that started as a few lines on trace paper under construction is the favorite part of my job. 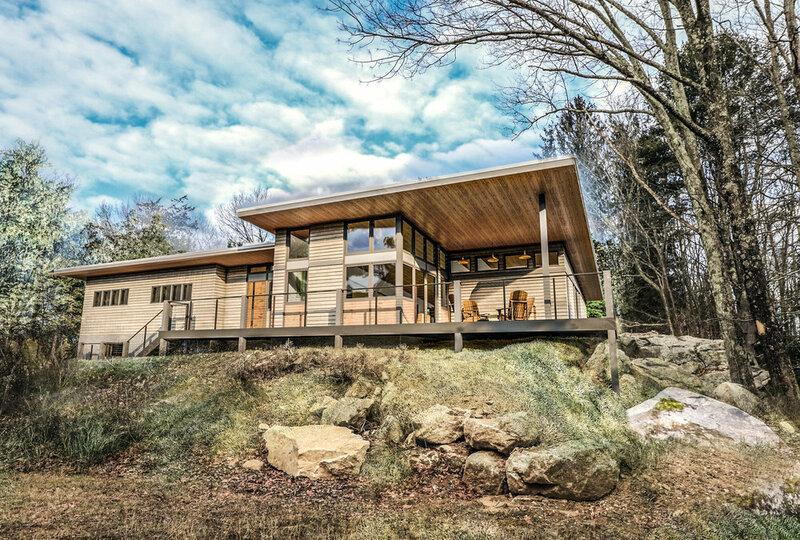 The “hebron hill house” is an addition and renovation to a private residence in central Connecticut. After an in-depth and collaborative design process with the owners the project is under construction and taking shape. Nestled on 23 acres of rolling hills, the hebron hill house is a mid-century modern make-over with an emphasis on daylight, technology, and taking in the surrounding views. A large living space faces south and overlooks the family pond. 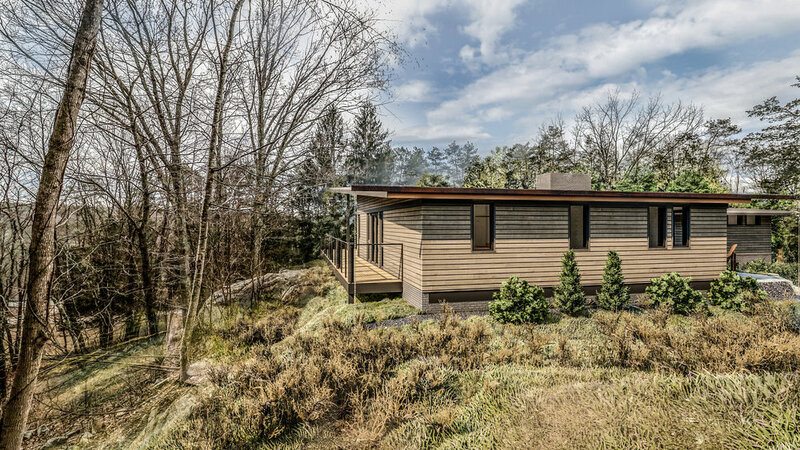 The addition of a new, larger, master-suite will allow the family to comfortably grow while creating privacy with a view. During our latest visit to the project site the carpenters were making progress on framing of the interior and exterior of the addition. Walking with the owner’s, the reality of what their new living room, master bedroom, and master bathroom will look and feel like was beginning to sink in. View of the framed master suite. The large glass sliding door and windows face south-east and overlook a private pond on the bucolic 23 acre site. Four clerestory windows provide natural light in the master bedroom while maintaining privacy. 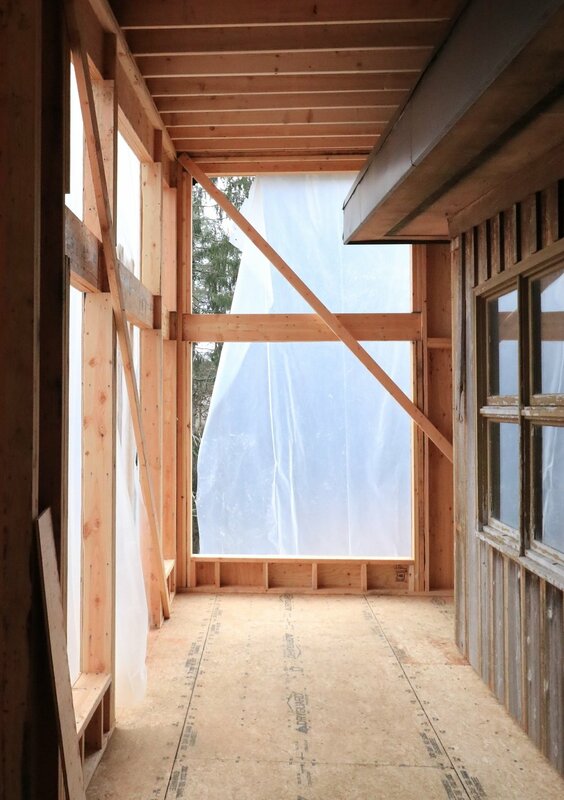 The existing house can be see to the right and will remain insulated and enclosed until the addition is water tight. Even though it is more narrow than when complete, the scale of the new living room and the south facing view is taking shape. This is what the complete living room will look like with views tot he South and Southeast. Here you can see the existing house tot eh left and the new addition taking shape. Here is a rendering of what the completed home will look like. This view is from the north looking south. A deck overlooking the view will wrap the east side of the addition. The final design can be seen here of the north elevation. Notice the deck along the east facade and the dramatic slope of the site exposing the view.